The contract for the next $100million construction stage of the Eastern Busway has officially been signed. Today Transport Minister Phil Twyford and Auckland Mayor Phil Goff joined Auckland Transport officials to sign the contract for the next stage of the project, which is a designated busway that will run between Panmure and Pakuranga. Auckland Mayor Phil Goff says, “For too long we have underinvested in public transport for East Auckland. As the area has grown, the roads have become more congested without suitable alternative transport options. “The $1.4 billion being invested in the Eastern Busway from Panmure to Botany helps rectify this. It will be transformational for the area. “Using the busway and the new Panmure rail station, commuters will be able to travel from Botany to Britomart in less than 40 minutes cutting travel time by more than a third. More people on public transport means fewer people in cars and less congestion. “The Eastern Busway is the second biggest transport infrastructure project after the City Rail Link. “The first section from Panmure to Pakuranga represents $275 million in spending with around $700 million of the total project cost funded from the Regional Fuel Tax which has enabled construction to be brought forward,” said Phil Goff. The Eastern Busway consists of several major pieces of infrastructure, including completing the urban busway between Panmure and Botany; associated key stations at Pakuranga and Botany; the Reeves Road flyover at Pakuranga town centre; and new/improved pedestrian and cycle facilities. A reduction in journey times and better accessibility to other parts of Auckland will improve the range of employment and leisure options for South-East Aucklanders. These factors were included as part of a report showing that AMETI Eastern Busway will generate around $680M of additional GDP over a 40-year period. Fulton Hogan, the New Zealand owned construction company, have been awarded the contract. They have also recently been involved in other major infrastructure projects including Auckland Northern Corridor and SH16 Causeway upgrade. Physical construction begins on-site in April and will take approximately two years. 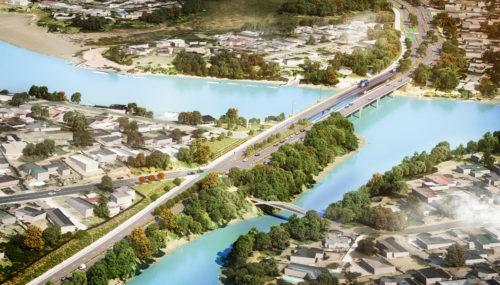 Parts of Lagoon Drive and Pakuranga Road will be widened to create a dedicated, congestion-free busway, similar to the hugely popular Northern Busway on the North Shore. Panmure Roundabout will be turned into a safer signalised intersection, there will be new cycle and walking paths, improved public spaces and reserves, a second bridge across Tamaki River and several intersection upgrades. Today’s contract signing also signals a strong commitment to “social procurement”, with specific clauses around minimum wage payments to workers and sub-contractors, recruitment practices (including for youth, Māori and Pacific Island people) and best practice environmental standards (including waste management and carbon emission monitoring). Auckland Transport Chief Executive Shane Ellison says, “This is Auckland Transport’s largest infrastructure contract and the announcement results from a rigorous process that involved a number of extremely well-qualified companies. Graeme Johnson, CEO NZ, Fulton Hogan says, “We’re proud to have been awarded the contract to deliver the AMETI Eastern Busway from Panmure to Pakuranga on behalf of Auckland Transport. Fulton Hogan is a New Zealand owned business, employing more than a thousand staff in the Auckland region.